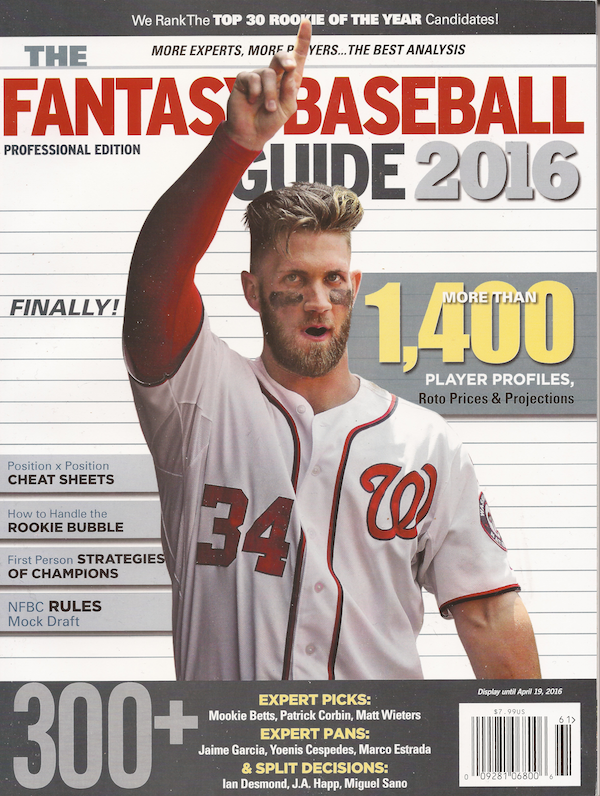 This is the place you’ll find updates and corrections and explanatory notes about the Fantasy Baseball Guide 2016. If you have a question or comment and don’t see it addressed here, please email rotoman@gmail.com. 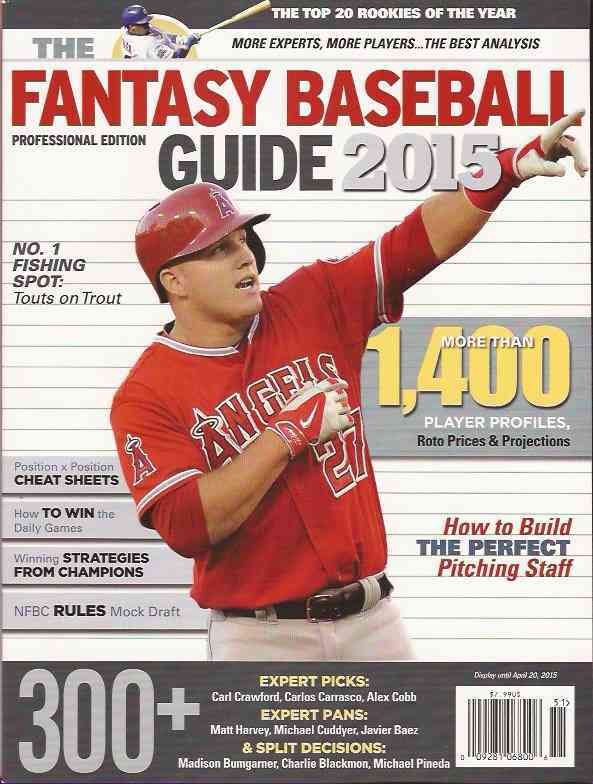 Download updated projections and bid prices for purchasers of the Guide right here. FBGUIDE2016-March Update-pro The password is the last name (in lower case) of the only $14 player on page 66 of the Fantasy Baseball Guide 2016. Raisel Iglesias (Page 28 and Page 122): This is a doozy. In the Draft at a Glance Chart on page 28 he’s listed twice, at $10 and $7. And then he’s profiled on page 122 with a Big Price of $8. You’ll note that along with his profile, in which HC Green says he has “considerable upside,” he scored seven picks and a single pan. Steve Moyer’s Pan was contrarian, based on what seemed like excessive enthusiasm from the chattering roto classes at Shandlerfest. Iglesias signed a long contract out of Cuba last spring, and was not considered a top prospect. A reliever in Cuba, he converted quickly to starting, was sent down to Triple-A to build his arm strength, and was excellent from August onward. That is, 45 strikeouts in 39.7 innings and a 2.27 ERA from August on. I can explain how he ended up twice in the Draft at a Glance chart. I changed his price from $7 to $10 late in the magazine’s production because of all those Picks. No way was he going for single digits this spring. We messed up the edit of the chart, and I missed the mess up while proofing. I have no idea how the $8 price ended up in the profile box. That must have been another fidget about his price. I think that may be a fair assessment of how Iglesias expressed his talent last year, but it would be a mistake to bid him up that high (into the $15-$20 range) based on his small sample of success. $10 seems fair, maybe $12 if your psyched, but odds are that’s not going to get him. Thanks to Jeffrey of Brooklyn for finding this mistake and a few others. It’s much appreciated. Will in Chicago Writes: “You asked for corrections? I look forward to reading the rest of the magazine. Does this correction make the blog? Kelby Tomlinson (page 89): Called up at the end of the season, when Joe Panik was down, Tomlinson had a very nice stint as the Giants regular second baseman. This comes on the heels of a good season in split between Double and Triple-A, during which he put up a MLE of 2 homers and 17 steals with a .275 BA in 375 AB. In the Guide I gave him 184 AB for 2016, because he’s blocked at second and short by players who are regulars when healthy. I also gave him a $9 Big Price, which reflects my enthusiasm for him should he find his way to at bats. Good contact speed guys in the middle infield are potent forces in deep fantasy leagues, but given the lack of a path to playing time Tomlinson’s price should have been $4, which is still enthusiastic. Also, his projected BA should be .275, good but not great. Jarrett Parker (Page 72): He had a sweet cup of coffee in September, but it was only 29 at bats (and really one 3 homer/7 ribbie game in Oakland). The formula chewed that into quite a 2016 season for the young slugger and strikeout fiend. Those numbers are way wrong. Parker’s MLE in Fresno for 2015 was a .224 BA, with 14 homers and 14 steals in 400+ at bats. His contact issues are a problem going forward, but the bigger change since the Guide closed is that the Giants added Denard Span, which makes Parker at least the fourth outfielder on their depth chart, if not the fifth. If he gets 295 at bats, as originally projected, he could hit seven homers and steal nine bases, while hitting .235 or so. At the same time, guys with solid minor league production but low contact rates do sometimes mash, at least for a while, if they get the chance to play. If Parker falls into some PT he’s certainly worth a short term for the power/speed thing, but his batting average is going to eventually hurt. 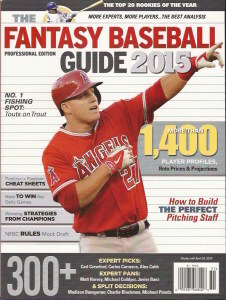 Rymer Liriano (page 64): For some reason he doesn’t have 2015 stats in his statbox. He played in Triple-A El Paso all year and the stats looked good:.292 BA, 14 homers, 16 steals, but Triple-A El Paso is not a real hitting environment. What looks like a rebound from 2014 struggles really wasn’t. The MLE for his 2015 Triple-A season is .229, with nine homers and 12 steals, not the stats of a major league corner outfielder, which perhaps explains why the Padres dropped him from their 40 man roster today (Jan. 22, 2016). He’s still young, he still has a chance to find a role as a useful parttimer perhaps, but clearly the Pads don’t think he has a chance to be a ML regular. CATCHER At A Glance (page 19): Devin Mesoraco was left off this chart because he only played four games last year. 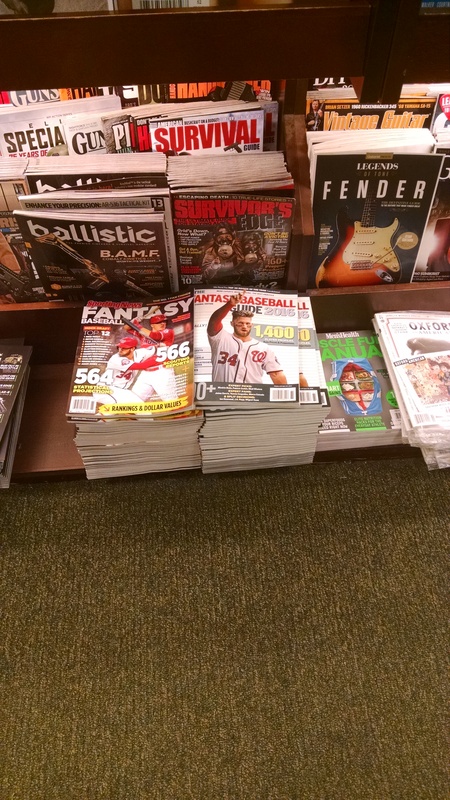 Usually a guy like him shows up in the DH section, and then I move him over. I don’t know how I missed him, especially because I have him priced at an aggressive $15. That’s a good price for him if he’s totally recovered from his hip problems, but that is hardly a sure thing. Hips are tricky. It’s too early to know, and upon reconsideration I would say that at this point he’s probably a $7 player, understanding that he could drop to $0 if he is reinjured, and likely to cost as much as $15-17 if he is actually healthy. 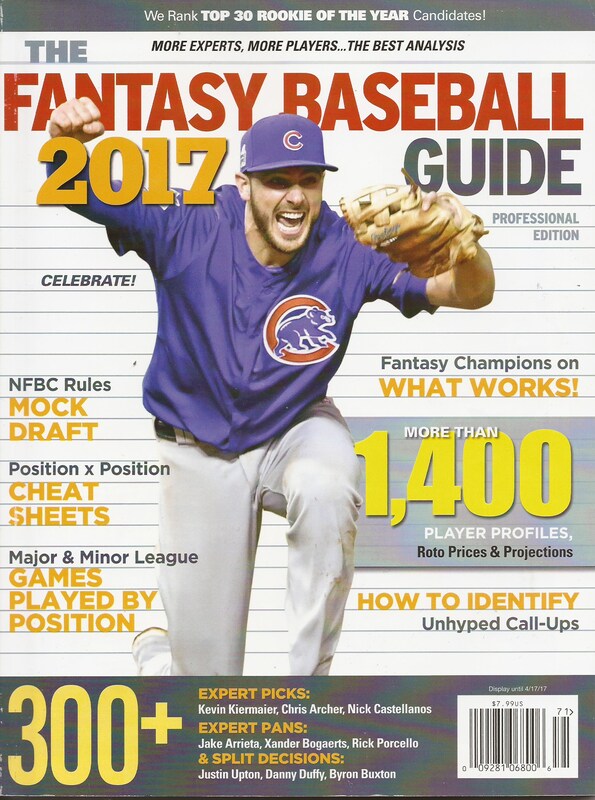 Kris Bryant’s Projection (page 37): There is no mechanical projection that can take a first year look at a player who played a part of a year in the majors and nail it. So, years ago I stopped pretending and started handling the one-year guys manually. The problem is that what comes out of the spreadsheet looks a lot like their first year numbers, and sometimes when I go through the list while putting the projections together for the magazine, I miss one. I missed Bryant. Partly because I think the quantitatives are pretty reasonable. It’s the batting average that bugs me. A 64 percent contact rate should be a .220 batting average. Bryant hits the ball so hard and has so consistently put up huge BABIPs, that you have to give him extra credit. So, maybe his BA should be .240-.250. No way can he sustain .275 striking out 30 percent of the time. So, .240, 90 R, 30 HR, 100 RBI, 13 SB seems about right. THE GUIDE, Lawr Michaels’ Picks and Pans: He sent them in in plenty of time. I didn’t cut them into my master file. They aren’t in this year’s Guide. Sorry about that, Lawr. But here they are . . .
Wilmer Flores: When Ruben Tejada lost his knee to Chase Utley in the playoffs, I heard people ask if the Mets could win without Tejada. Huh? Flores, who did play 137 games last year, hit 16 big flies and didn’t turn 24 till August. He is going to be good. Henry Owens: For a team struggling so deeply to identify decent starting pitching in 2015, it is impressive that the team was so concerted with the development and promotion of lefty Owens. The tall (6’6”) hurler whiffed 572 over 516 minor league frames, and then went 2-2, 3.38 over last five starts at Fenway. Not that it matters, but he does have the strange Twitter handle of @H____O_______. Anthony DeSclafani: Sneaky good starter, DeSclafani might well be dismissed by owners who look to ERA, but if he can build on the 9.6 K per nine innings he grabbed the last month, the righty makes a nice fourth starter gamble for probably cheap. Brandon Finnegan: Potentially dominant, Finnegan, the Royals #1 pick in 2014 had enough skills to debut that same year. 55 whiffs over 55 big league innings, Finnegan might be overlooked based upon his 2015 line. Greg Bird: Arod and Teix are 75 years old between them, and if anyone thinks they can knock off 500 at-bats each, I know of tickets on a space shuttle trip to Alpha Centauri you might like. Bird will establish himself as a starter by June, and that will be that. Stephen Piscotty: Pretty hard to not like a Stanford alum who debuts as well as Piscotty did last year. Xander Bogaerts: Big jump in skill mastery last year as Bogaerts knocked out 199 hits. With his youthful Boston mates, Bogaerts will simply get better. Gary Sanchez: He is big and slow and has a lot of pop, and just looks like he should be a Yankees catcher. What is not to like? Marcell Ozuna: So, talented, but pushed forward so quickly, I am guessing Ozuna matures a little and settles down with the Fish, or better gets swapped, picks it up, and haunts Miami for the next ten years. Randall Grichuk: First round pick of the Angels in 2009, then stolen by the Cards for David Freese, Grichuk has the stuff to replace Matt Holliday in all ways except a crappy attitude. Ender Inciarte: Finished fifth in ROY polling in 2014, and stepped it up last year and hit .303 while steaking 21. This kid is good. Brad Miller: More power first half, more plate discipline second half. I am guessing he learned. Scott Kazmir: Great story. Great comeback. Learned to pitch, but I fear the ride is over. Gerrado Parra: Baseline is probably a lot closer to his Baltimore 2015 line as opposed to his Milwaukee one. Taylor Jungman: A 4.10 minor league ERA with a 1.358 WHIP tells me 2015 was an anomaly, and 2016 means a correction. ASK ROTOMAN: Puzzled About Prices! As a long time reader of the Guide I find this year’s dollar valuations puzzling. Case in point: Arrieta at $19 and Kennedy at $2. Will the update on March 15 contain new dollar amounts for pitchers or just playing time adjustments which pertain primarily to position players? The mid-March free update to the projections and prices in the Guide will reflect my latest thinking about all the players in the Guide, plus those added and subtracted from the pool due to injury or other circumstances. The link will show up here, at blog.askrotoman.com, and will be password protected, so it is only available to those who have purchased the Guide. 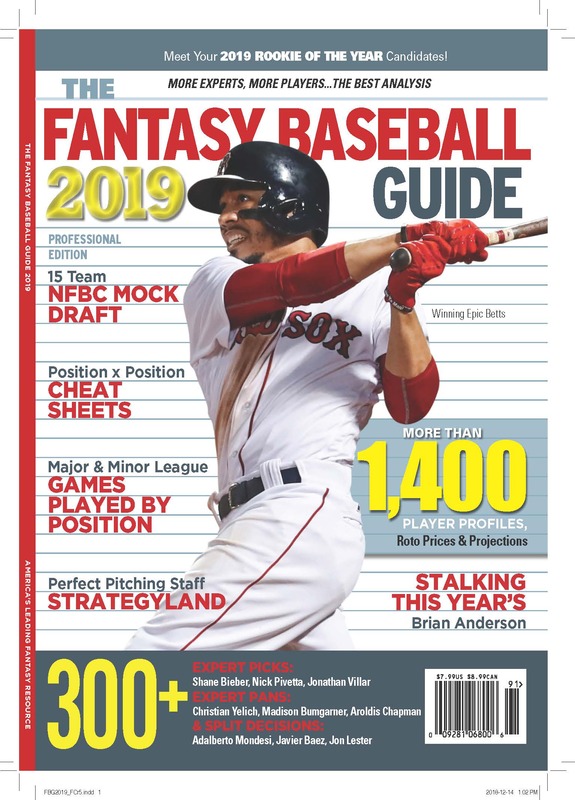 Commercial Break: The Fantasy Baseball Guide is available at many book, drug, grocery and WalMart stores, but it has been out now for a month and is sold out in some venues. 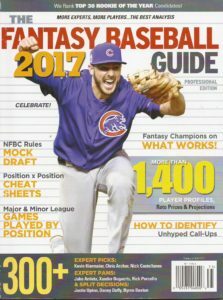 You can buy the online version at thefantasysportsguide.com. Use the promo code Rotoman2015 and save $1! To create the Big Prices in the Guide, which are my suggested bid prices for players, I try to combine two bits of information. The first is what I expect a player to earn this year. I look at what he’s earned in the past (in Arrieta’s case, $23 last year, in Kennedy’s, $6, -$15, $4 the last three years) and make an estimate. The second part is to read what the market will be for the player come March, and whether I want to be ahead of it or behind it. In Arrieta’s case, he had a break out second half last year following an adjustment to his delivery. He has great stuff, and I feel pretty confident that he’ll be able to repeat as a $23 earner. Or somewhere close. I’m sure other people will be more skeptical, so I knocked his price down to a $19 bid price, because I want to own him. In Kennedy’s case, he can be an effective pitcher at times, but he’s not developed as the dominant arm he showed back with the Yankees when he came up, mostly because he allows a lot of baserunners. I think a repeat of last year’s numbers is the likely outcome for him, in a range, and only want Kennedy if I get him at the very end of the auction. In the Guide Mike Fenger says drop out before he reaches $10, but I think that’s counting too much on improvement. I would prefer to hedge against failure. Hence, the $2 bid price. Now, I’ve heard from plenty of people who think Arrieta’s unlikely to earn $19 next year, because he allowed so few homers on fly balls, and because they’ve gotten used to him not being very good. 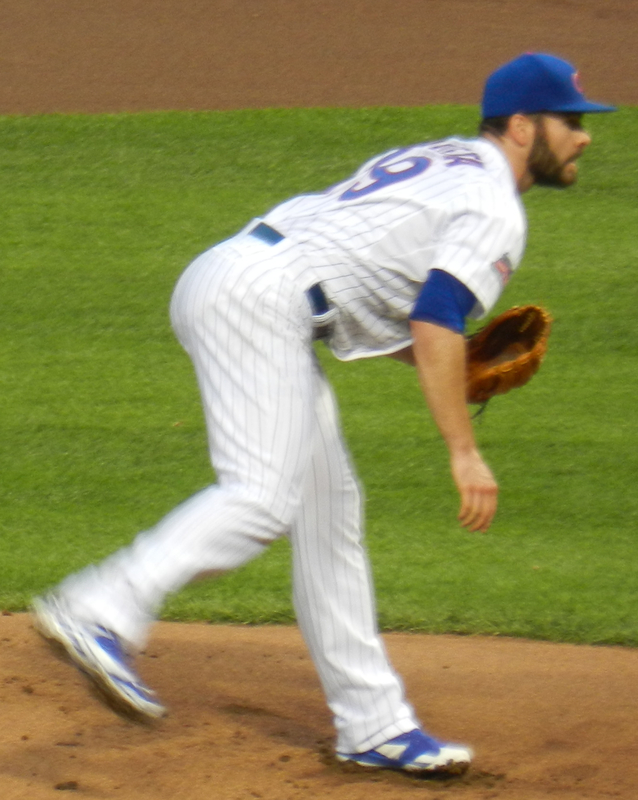 I think they’re wrong about Arrieta’s probable success, but what I’m hearing is that the market for Arrieta may be even weaker than I expected. In which case I may drop his price some more going forward. My goal is to estimate what it’s going to take to buy him, and if I want him enough, add enough to get him in most auctions. Unless I bump into someone thinking like me. As for Kennedy, his team has improved offensively in the offseason, something not included in that $2 bid price. As I work to balance the books, as we get closer to the season, he’s a guy who might bounce up a dollar or two. He’s not a bad buy at $4, but I think he is at $9, though it wouldn’t surprise me if he earned that. It is certainly possible. You can see updated bid prices at pattonandco.com, by the way, and that’s a good place (once you’re registered) to ask why I’m thinking this way or that. The final point about the prices is that they are a work in progress. I use them in my auctions, so they seriously reflect my thinking, but I seriously expect you, the reader, to make your own evaluations and shape your auction by second guessing me. You may think I’m crazy about Arrieta, and you might drop his bid price to $12, but you do so knowing that there is at least one person like me out there who would pay $17 for him. If you let me have him at $13, you’re giving me $4 more dollars than I expected to have elsewhere.